Envy is one of the brands that have been around for some time, and I appreciate their reasonable prices. Their tagline is “The world’s smallest E-cigarette,” and I think that is probably true. Envy is more or less reasonable; they work well enough for their price. As they are so affordable, you can’t expect the best quality in the world. If you are on a very tight budget, I think these are a pretty good buy. Envy has a pretty good variety of starter kits. The cheap and aptly named Economy kit is $20 and comes with a USB charger, 7 cartomizers and a little bitty battery. This is a pretty good deal. Envy also has Tank Atomizers, and if you want those, the starter kits cost a little more. If you decide to get a start kit from Envy, get the Tanks. Don’t waste your time with their other ones. When you order the Tanks, you will see that they are a three piece assembly. The atomizer is operated with a little button and the tank itself screws onto the battery and is shaped like a little cone. The last part of the Tank is the liquid storage area. When you first receive your kit in the mail, you will see that your tank is pre-filled and all you need to do is to screw it on to the battery and be sure the opening at the top fits through. As you attach them, the little cap made of silicone on the top will be popped and then the liquid is released into the tank. From there it can access the heater. This is a cool design; it ensures no leaking and a fresh e-liquid. This is enough to get them many points, and the vapour is decent. It is not amazing or anything, but it was a good, solid 7. So while your first order gives you a fair amount of product for the price, tearing through one tank a day means you should have a lot of backup. You can also just refill them yourself, and if you like their liquid. Or, you can get liquid from another company and just use their tank devices if you have an affinity for the e-liquid of another company. As I mentioned, the battery is itty bitty. 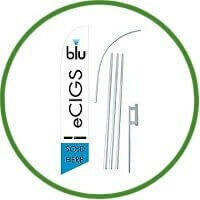 Since they are the world’s smallest e-cigarette (their words – not mine!) they also seem to have one of the world’s smallest lifespan. At least, they include their portable charging case with the Premium Kit so that you can charge on the go. So if you are getting a starter kit from Envy, go with the Premium so that you can keep it charged. For some reason, Envy has chosen to name all of their flavours after alcoholic drinks. I don’t get it. Is that supposed to be hip? They have 20 different flavours, and I do appreciate variety. They have not named their tobacco or menthol after alcohol. Some of the fruity flavours, the ones with the dumb names, were not very inspiring or different, regardless of the strangeness of their names. Affordability is very important and Envy definitely has that. This also means that Envy is really great for those who are just starting out and not willing to make a big investment. Envy works, Envy is cheap, and Envy is alright. There are assuredly better brands out there, but Envy has a lot going on for them. The Tank systems are great. Stick to the tanks and you will be fine!